The hysteria over witches among the people of Salem swept the region like a disease in 1692. As is the case in any tragic event, there are those whom will use the circumstances to their advantage. Under the veil of the witch-hunt lie other motivations; power, greed, revenge and righteousness. 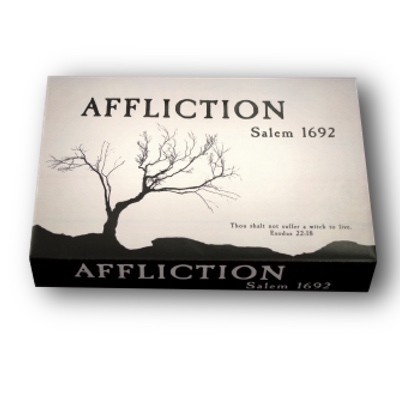 AFFLICTION: Salem 1692 is a game set in the hysteria of a witch-hunt. Use your influence to whisper in the ear of the magistrate, judge, governor or minister to protect some and have others arrested. Salem was a chance to gain property, exact revenge and prove one’s righteousness. The characters in the game were actual residents of the Salem region. This is the closest possible simulation of actual events in a game to date. 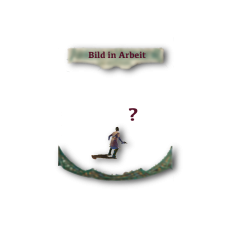 GAMEPLAY: Players will take turns placing a “messenger” (worker) to select actions. 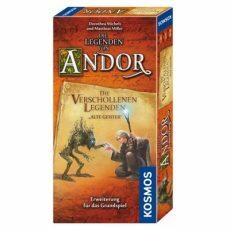 After all workers are placed, actions will be resolved in the order they appear on the main board. EXONERATE – Take 2 Accusation Tokens off of any Colonist. FIRST PLAYER TOKEN/PROTECTION – Use a letter from the Governor to prevent one Colonist from being arrested and take the First turn, next turn. GAIN INFLUENCE/USE COLONIST ABILITY – Generate Influence and use the abilities of Colonists that you have in your Circle. ARREST – Spend Influence equal to a Colonist’s adjusted Reputation to Arrest. SPECTRAL EVIDENCE – Use this token to prevent a Colonist from Generating Influence and using their Colonist ability. ACCUSE – Place accusation tokens to reduce Colonist’s Reputations to make them easier to arrest. BRING COLONIST INTO CIRCLE – Spend Influence equal to a Colonists Base Reputation and bring them into your Circle. Play will cycle between accusing, arresting and protecting your interests. Fear provides an alternative way to function when necessary. END GAME: Increase Mather and Mary Spencer Hill are shuffled in with the bottom 6 cards of the Colonist deck. When either of them appears in the play area, the game immediately ends. VICTORY CONDITIONS: All players will receive victory points for the Reputation value of each Colonist that have arrested or brought into their circle, victory points for the property of those they have had arrested and for the number of influence tokens they have at the end of the game. Each player will also receive points for having specific families arrested or protected, depending on the player tile they are given.